While hay is often used to feed cows through the winter, current prices make corn a competitive option to feeding hay. Photo credit Troy Walz. Feed costs make up the largest expense in a cow-calf operation. While hay is often used to feed cows through the winter, current prices make corn a competitive option to feeding hay. Considering corn has a higher energy content than hay, the cost of feeding hay is often higher than corn on a price per pound of energy basis. For example, corn priced at $3.30/bushel ($118/ton) equates to approximately $0.08 per pound of total digestible nutrients (TDN) while hay priced at $100/ton is nearly $0.11 per pound of TDN. A study conducted at The Ohio State University evaluated limit-feeding corn as an alternative to hay for mature cows in gestation and early lactation. Cows were either fed around 11 pounds of whole shelled corn, 2.5 pounds of a pelleted supplement, and 2 pounds of hay (dry matter basis) or offered hay and a salt and mineral mix free choice from November to April. Hay was predominantly first-cutting orchardgrass testing around 72% neutral detergent fiber (NDF) and 9.5% crude protein (CP). Cows fed free choice hay ate twice as much feed resulting in double the feed costs compared to limit feeding the corn-based diet. The results of this study suggest that corn can be limit fed to meet the nutrient requirements of cows without negatively impacting performance, conception rate, or calf weaning weight. When utilizing a limit fed, grain-based diet, there are several factors producers should take into consideration to help facilitate the success of the program. Adjust cows to the limit fed diet over a week to ten-day period by gradually increasing the corn and reducing the hay to desired levels. This will help cows transition to the new ration and minimize digestive upsets. Provide at least 24 to 30 inches of bunk space per cow. Adequate space is needed to ensure that all cows have an opportunity to eat the limited feed that will be provided. Utilize an ionophore to improve feed efficiency and help minimize digestive upsets. Divide cows into groups based on age and pecking order, if possible, so that boss cows do not keep younger and more timid cows from getting their share of the ration. Realize that cows will act hungry when receiving a limit fed diet, even though the ration is meeting the nutrient needs of the cow. Feed cows at a consistent time each day to help minimize cows displaying discontented behavior. Adjust the ration for changes in the cow’s nutrient requirements as needed. The nutrient needs of the cow are highest during late gestation and early lactation. Additionally, cold weather events can increase the energy requirements of the cow. Depending on current commodity prices and availability, there is opportunity to winter cows using alternative energy sources to hay. Limit feeding a corn-based diet can be a cost effective option for meeting the nutrient requirements of cows. The University of Nebraska has conducted several studies to evaluate limit feeding cows. For more information, please see the Dry Lot Beef Cow/Calf Enterprise page at beef.unl.edu. For assistance with evaluating cost differences of feedstuffs, consider using the Feed Cost Cow-Q-Lator. Loerch, Steven. 1996. 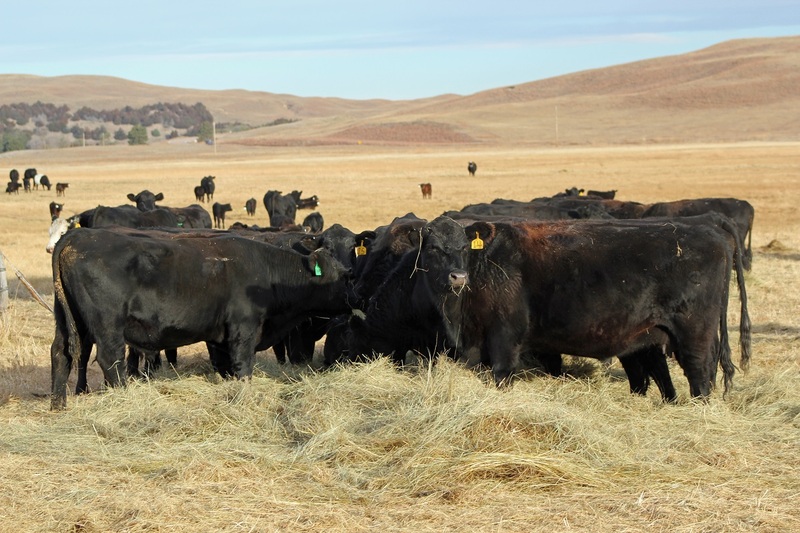 Limit-feeding corn as an alternative to hay for gestating beef cows. J. Anim. Sci. 74: 1211-1216.